The San Jose Sharks have been ridiculed over the years for their inability to take talented teams to the Stanley Cup Finals. They've been the Washington Capitals of the West, or perhaps the Caps have been the San Jose Sharks of the East, but either way they've underscored just how difficult it is to win the conference, let alone the Stanley Cup. But this has been a year of redemption on both sides, and their story has some similarities to that of the Pittsburgh Penguins. While the Pens squeaked into the playoffs last year before bottoming out in December and firing their coach, that process happened in San Jose at the end of last season. 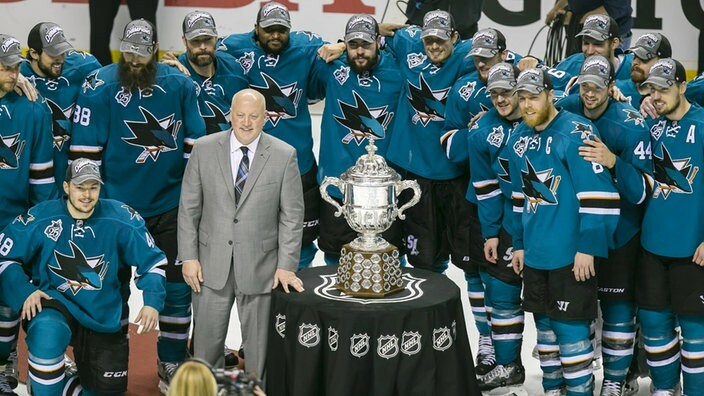 Long time coach Todd McLellan was fired after the Sharks failed to advance to the postseason since 2003, and in came Peter DeBoer, the former coach of the Florida Panthers and New Jersey Devils. And while DeBoer over saw a New Jersey team that made a surprising trip to the Cup Finals in 2012, he was usually given little to work with and usually got little out of them. Like the Pens were supposed to be watching the window close on Sidney Crosby and Evgeni Malkin's prime years, the Sharks were supposed to be watching the window begin to close on the careers of Joe Thornton and Patrick Marleau, both 36 years old. The former 1st and 2nd overall picks of the 1997 NHL Draft, the two have been the Sharks franchise since Thornton came over during the 2005-06 season - strangely enough, the year he won the Hart Trophy. But the Sharks did rebound in 2015-16 in the weak Pacific Division, finishing 3rd and making the playoffs. However, they appeared to have one of the most difficult draws in the entire bracket. As the playoffs began, it appeared that they'd have to go through two Cup favorites, the Los Angeles Kings and Anaheim Ducks, to advance to the Western Conference Finals. 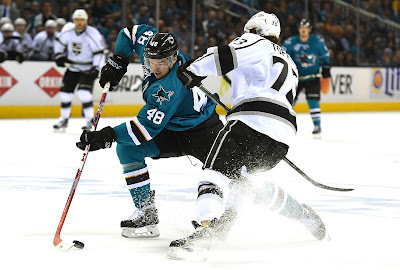 The Sharks would travel to L.A. to face the Kings in the opening round, their nemesis who had eliminated them each of their last two trips to the postseason, including in 2013-14 when San Jose blew a 3-0 series lead in the opening round. A pair of one goal victories in a high-scoring 4-3 Game 1 and a defensive 2-1 Game 2 would allow the Sharks to build a 2-0 lead traveling back home. And when Joe Thornton scored his first of the playoffs in the opening minute of Game 3, it'd appear that San Jose was well on the way to exorcising their demons. However, Anze Kopitar answered on the power play later in the period, and the 1-1 held up for the rest of regulation to force overtime. 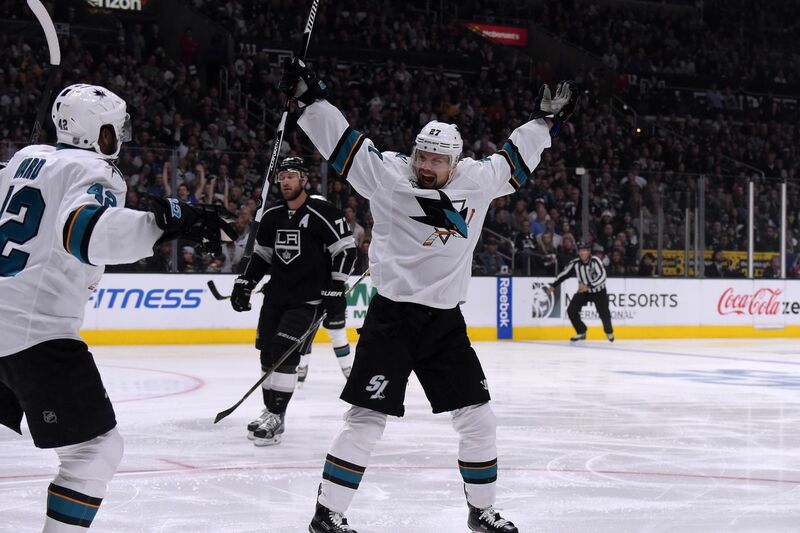 And just minutes in, Tanner Pearson was the unlikely hero, scoring the game winner to give the Kings the 2-1 win and trim the Sharks' series lead to 2-1 in the process. Given past playoff results, the Kings' win in Game 3 might have seemed like the start of another let down for San Jose, but they quickly put that talk to rest in Game 4 as they raced out to a 3-0 lead. Los Angeles made a push in the 3rd period, cutting the lead to one with a lot of time left on the clock, but the Sharks held on to take the 3-1 series lead. And in Game 5, they put the exclamation point on the series and cemented the fact that this was going to be a different team than previous years. After taking another 3-0 lead early in the 2nd period, they watched that lead disappear before the second intermission after the Kings put three straight up on the board. But again, they showed a resolve the previous Sharks teams weren't able to manage, and after 3 goals in the 3rd period they were moving past their in-state rivals and on to the next round. 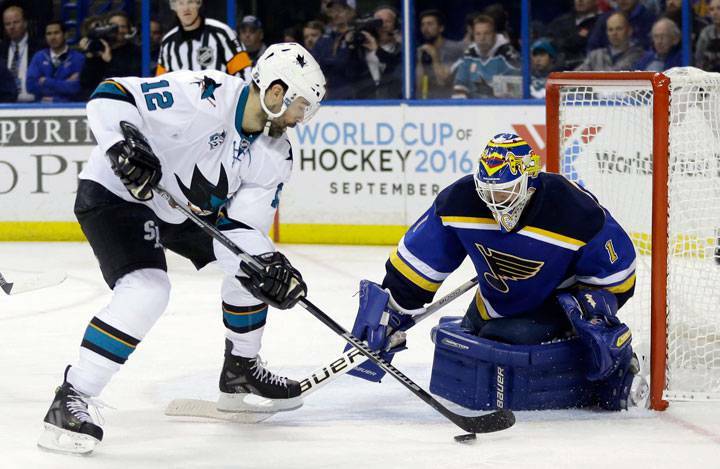 It was the new wave of Sharks who powered San Jose to the Western Conference Semifinals. Brent Burns had a huge series, leading the team with 8 points (2g, 6a) to go along with a team-high 23:58 in ice time. Captain Joe Pavelski was huge in putting up 5 goals and an assist in the five games, while Logan Couture had a goal to go along with his 5 assists. Unlike previous years, Joe Thornton (1g, 2a) and Patrick Marleau (1g, 3a) were able to show up and play well without worrying about carrying the weight of the team on their shoulders. Martin Jones also played well enough in goal to move on, posting a 0.912 SV% to go along with a 2.18 GAA. In a stroke of luck, the Sharks wouldn't have to face the Ducks, who fell in 7 games to the Nashville Predators, allowing them to start their second round series at home against an arguably easier opponent. But as they'd find out, that didn't mean they'd be an easy out. San Jose had a great start to the series as they won both their home games. After falling behind 1-0 after two period in Game 1, the Sharks exploded for 5 goals in the 3rd period. Game 2 would also see a big 3rd period, this time with San Jose taking a 1-0 lead into the final frame, and both teams put two goals up on the board in the final 20 minutes to give the Sharks the 3-2 win and the 2-0 series lead. Things were going great for San Jose, but they'd hit a road bump when they flew out to Nashville. 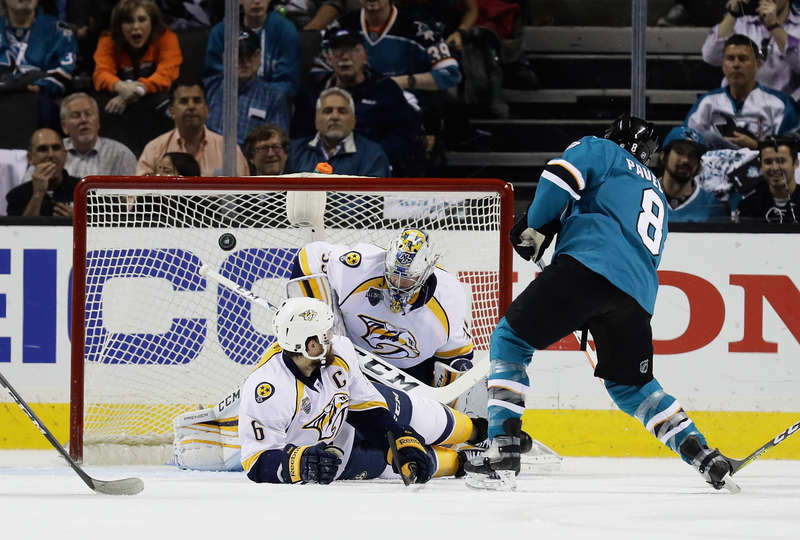 The Sharks would take a 1-0 lead midway through the 1st period, but at risk of falling into a 3-0 series hole, the Predators roared back and scored four straight unanswered goals to take the 4-1 win. Game 4 was a tight contest with both sides trading goals throughout the game to set up a classic overtime with the score tied 3-3. The first overtime would come and go with neither team getting the game winner. The second overtime would come and go with still no goal up on the board. It was a game with huge implications, as the series would either go back to San Jose tied or with the Sharks having a commanding 3-1 lead. And midway through the third overtime, it'd be Mike Fisher slipping a rebound around Martin Jones to give Nashville the win and keep the series competitive. Just like in the previous series against the Kings, the Sharks would handle the adversity well against the Predators. On home ice, San Jose rebounded nicely and dominated Nashville with a 5-1 drubbing, putting the team one win away from returning to the Western Conference Finals for the first time since 2011. However, they again stumbled when the series shifted back to Nashville as the Predators were able to overcome an early 2-0 deficit to force overtime, and they escaped with another 4-3 overtime win to force a decisive Game 7. Anything can happen in a single game, but the Sharks put to bed any thoughts of falling short, thrashing the Preds 5-0 with goals from all their big name forwards - Pavelski, Couture, Thornton, Marleau, and Joel Ward. Again, the Sharks got great productions from the top of their lineup. 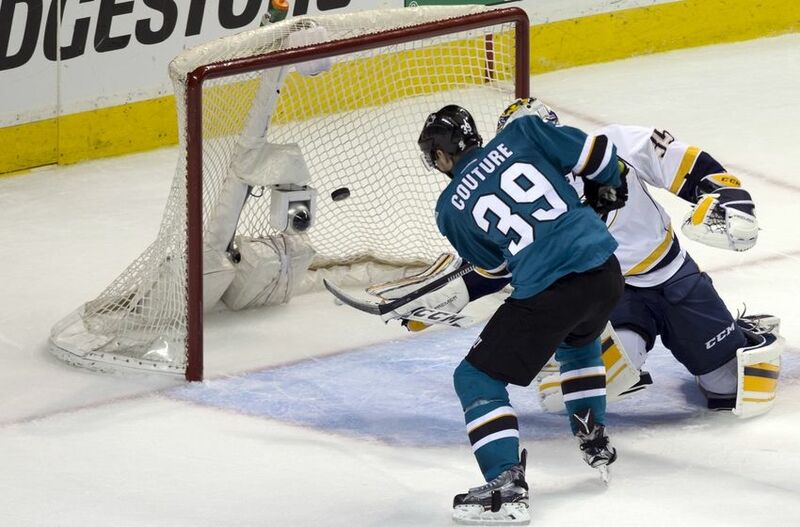 Logan Couture led the way with 11 points (6g, 5a), and Joe Thornton had a big series with 8 points (2g, 6a). 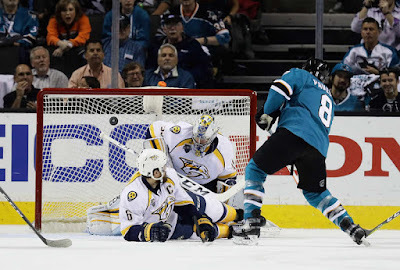 A trio of big names weren't far behind them either: Joe Pavelski (4g, 3a), Brent Burns (2g, 5a), and Marc-Edouard Vlasic (7a) all hit a point per game in the series as well, and Martin Jones had a good series as well with a 0.922 SV% and 2.16 GAA. With a conference that had been dominated by the Chicago Blackhawks and Los Angeles Kings in recent years, the Western Conference Finals would be a matchup of Cup-less teams that vanquished the titans of the conference in the opening round. The St. Louis Blues took out the defending Stanley Cup Champion Blackhawks in the first round before beating the West's top seed in the Dallas Stars to advance to the WCF. 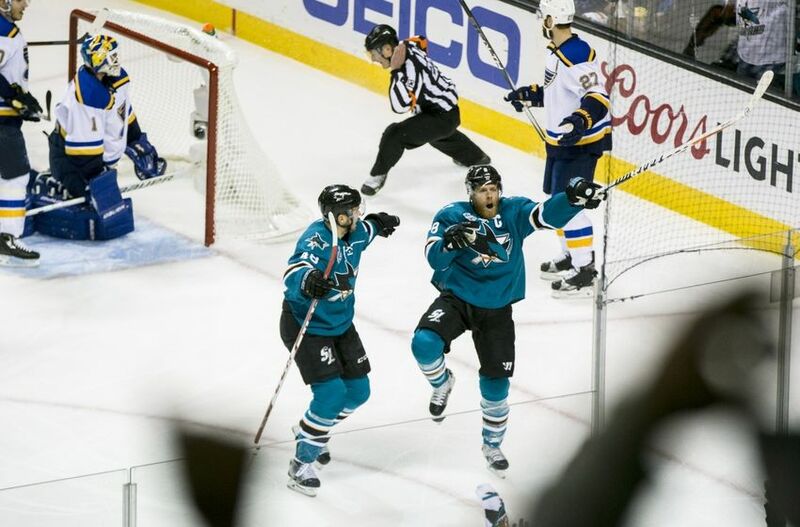 The series started off in St. Louis with the Blues taking a 2-1 Game 1 win in a defensive contest before an offensive explosion from the Sharks in a 4-0 Game 2 blowout. After splitting the games in St. Louis, they'd split the next two in San Jose as well. A pair of Tomas Hertl goals would help power the Sharks past the Blues 3-0 in Game 3, while game 4 would be all St. Louis. The Blue raced out to a 4-0 lead through two periods, and though the 3rd period would be a high scoring affair, it would end with a 6-3 win in favor of the visitors and a tie series heading back to St. Louis. That'd be about as close as the Blues were able to come to moving on to the franchise's first Stanley Cup Finals since 1970. 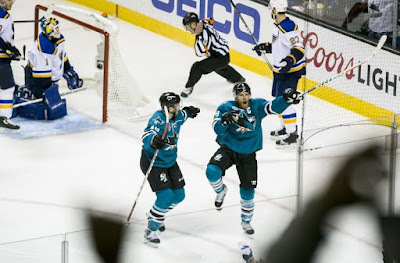 The Sharks flipped the script on the Blues in Game 6 as they beat St. Louis by a 6-3 final score as Joe Pavelski and Joel Ward each potted a pair of goals, and unlike in the series against the Predators, San Jose wouldn't let their opponents linger around. Ward had another two goal night as the Sharks raced out to a 4-0 lead and eventual 5-2 series-clinching win. The victory gave San Jose the first Western Conference title in their 25 year history, and like the previous round their big guns came out firing. Joe Pavelski had another huge series, netting 9 points (4g, 5a) in the 6 games against the Blues, with Logan Couture (1g, 6a) and and Joe Thornton (7a) each topping a point per game. Martin Jones continued his solid play in net as well, and the 0.920 SV% and 2.02 GAA were enough to power the Sharks to the Stanley Cup Finals. Like the Penguins, the Sharks were able to overcome their perceived slide back into mediocrity on their way to marching through their conference en route to the Finals. They're a strong team that will meet an opponent who is able to match the considerable star power that they possess. Both teams have depth and high end talent, and it should set the stage for a close, entertaining series that should be one for the ages.